DOES AN INCREASE IN THE STRENGTH OF THE STEEL THAT IS USED IN THE REINFORCEMENT IMPROVE THE MECHANICAL BEHAVIOR OF THE WALL? For control of cracking, the strength of the steel in the reinforcement has no influence on the amount of reinforcement needed, only the area of the cross- section. When the reinforcement is assigned a structural role, the fact the steel is stronger, does not mean necessarily that you reduce the amount of reinforcement in the same proportions. Because by the requirements of the minimum amount, in the vast majority of cases, steel does not display even half of the resistance. It is the parameter of steel reinforcement which really improves the mechanical performance in the wall, on account of its ductility, not of the resistance. For this reason, to prevent cracking, moving forces with the reinforcement it is preferable that the steel has a high percentage of deformation at failure (that is the parameter which determines ductility) than high resistance. HOW TO EXECUTE A CORRECT OVERLAP? You cut the ends of the transverse wire. In accordance with the specifications of the current standards, a correct overlap between truss type masonry reinforcement should meet the following requirements: Length of overlap: 250 mm (0,6 the distance of the pitch of the cross-wires). Horizontal distance between overlapped wires: 20 mm. Lateral coating of the wires that have been cut: 30 mm (except stainless steel wires). IMPORTANT: At the ends of the reinforcement for structural use it must meet the tree requirements: ADHESION, MORTAR COATING and OVERLAP. HOW TO CHOOSE THE CORRECT WIDTH OF THE REINFORCEMENT? The coating with mortar of the masonry reinforcement is a fundamental requirement to ensure the protection of the steel from corrosion. Therefore, when it comes to getting this benefit, the conditions of coating have different importance according to the finishing of the masonry reinforcement. However, the coating is also an essential requirement for the proper transmission of forces of adhesion in the overlap areas and this is common for all the masonry reinforcements with structural use, independently of the type of finish. In order to achieve this provision, you must respect the minimum thickness of coating, both upper and lower, as well as lateral. Side coating in the areas of overlap is essential so that there is the transmission of efforts between the piece of reinforcement and the adjoining one, this circumstance must be taken into account when choosing the width of the reinforcement so that it is appropriate to the thickness of the wall. If the reinforcement does not have a specific design for the overlap, you must limit your width to allow the correct covering along the reinforcement longitudinally. R – TRUE WIDTH OF THE REINFORCEMENT = N + 20 mm + Ø OF THE LONGITUDINAL WIRE. total width of the mortar ≥ that R + 30 mm. Total width of the mortar = N + 20 mm + Ø + 30 mm. 110 = N + 20 + 4 + 30 N = 110 – 54 N = 56 mm ~ masonry reinforcement of 50 mm width. 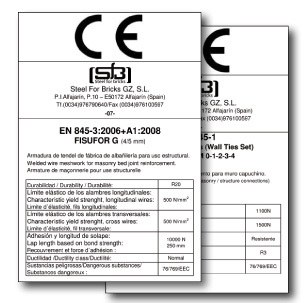 The right masonry reinforcement for a wall of 11,5 cm has a width of 50 mm. DOES THE WIDTH AFFECT THE BENEFITS OF THE REINFORCEMENT IN THE MASONRY? Reinforcement for the use of cracking control does not require a specific width, since the only thing that matters in this case is the area of the steel section. On the contrary, the width of the reinforcement has a fundamental role when it has a function structurally, because by increasing the mechanical arm is increased by the same proportion, the horizontal capacity resistance of bending in the walls of the masonry. DOES CORRUGATED WIRE IMPROVE THE ADHESION? The reinforcement does not improve at all by the fact the wire is corrugated. The conditions for grip relating to transferring forces evenly through-out small-diameter bars, such as the type of masonry reinforcement depend more on the measure of mortar and not the masonry reinforcement. Grip provided by corrugated bars is only needed when the forces you may have are very large, this only occurs within very thick bars. In the case of the reinforcement a number is worth a thousand words, two bars of 4mm in diameter can transfer securely 10kN, following the required regulations. This value has been tested on smooth bars of reinforcement. Furthermore the calculation shows the real value of the force that is transferred across the reinforcement (that is met by the minimum quantity requirements) in worst case scenarios, is approximately half. Consequently the corrugated reinforcement makes no extra benefits of reinforcement that weren’t in the traditional reinforcement. It is important that the technique of reinforced concrete, capable of transferring large forces, use normal plain bars when they have a small diameter. What really improves the transmission of forces is the existence of a suitable cover of reinforcement in the overlap areas. IS THE ADHESION OF THE MASONRY REINFORCEMENT IMPORTANT? The adhesion of the reinforcement, if you are using the truss-type, does not intervene with the transmission of forces between the first and last node of the truss. The transmission of forces in these sections is performed entirely through the diagonal wires, even without mortar, by virtue of their geometrical configuration, indeformable in their plane. Where it is really essential for the adherence of transmission of forces between the ends of pieces of reinforcement where the truss ends. This is why the overlap needs, a length proportionate to the forces that are transmitted and adequate cover in the overlap area. To transfer the maximum force that it can withstand equally in the reinforcement, a sufficient overlap length of 250mm is needed (this value must be verified by tests). To achieve the adequate transfer of adhesion and forces in the overlap areas, the wires must be spaced when overlapping to a distance equal to their diameter. For control of cracking, the strength of the steel in the reinforcement has no influence on the amount of reinforcement needed, only the area of the cross section. When the reinforcement is assigned a structural role, the fact the steel is stronger, does not mean necessarily that you reduce the amount of reinforcement in the same proportions. Because by the requirements of the minimum amount, in the vast majority of cases, steel does not display even half of the resistance. It is the parameter of steel in the masonry reinforcement which really improves the mechanical performance in the wall is ductility, not resistance. For this reason, to prevent cracking, moving forces with the reinforcement it is preferable that the steel has a high percentage of deformation at failure (that is the parameter which determines ductility) than high resistance. WHAT TYPES OF PROTECTION DOES THE REINFORCEMENT HAVE AGAINST CORROSION DO I HAVE TO CHOOSE FROM? - Aggressive marine–Stainless steel environment. AREN’T DIFFERENT REINFORCEMENTS REALLY EQUIVALENT? As a general example to meet the minimum amounts required in the Eurocode to achieve a masonry assembled for the purpose of reducing cracking, it is sufficient to place masonry reinforcement of 3mm Ø every 60cm. IS FLATTENED LADDER TYPE REINFORCEMENT THE SAME AS ROUND TRUSS TYPE? Having the same wire diameter should not be confused with having the same level of reinforcement. When comparing the different types of reinforcement for crack control the calculation for the amount is to do with the surface area of steel facing any vertical section of the wall. With truss-type reinforcement there are always three wires in contact the entire length, in contrast, in a ladder type you only have two. Therefore to meet the minimum requirements of reinforcement, comparing both types the truss type is needed less in the wall per square meter. Furthermore when the reinforcement is assigned a structural role to withstand lateral side actions the only acceptable geometric configuration is the truss-type, for being the only non-deformable one in its own plane. I WANT TO BUILD MY WALLS TO PREVENT CRACKING, HOW MUCH REINFORCEMENT SHOULD I PUT? The Eurocode explicitly defines the minimum amount of reinforcement needed to give ductility to the masonry and prevent cracking. In this sense, it determines the vertical separation between reinforced rows will not surpass 60cm and the area of steel will not be less than 0.03% of the area of the wall. The measure is preventative, and given that it is explicitly stated in the Eurocode it can help deal with the civil responsibility derived from pathological processes produced by cracking in the walls. However this measure by itself does not guarantee 100% of the absence of fissures. What is really effective to avoid cracking is a good constructive design solution to avoid risk situations. TO IMPROVE THE PERFORMANCE OF MY WALL IN SEISMIC EVENTS, WILL I NEED TO PUT A LOT OF BED JOINT REINFORCEMENT? For seismic events, the reinforcement itself will improve the mechanical behaviour of the wall because of its ductile properties. However for the same reasons given previously, this cannot be assigned stability of the wall to the reinforcement itself. For the reinforcement to be calculated into seismic effects, it should be accompanied by other elements of retention, such as anchors to the pillars. AS I HAVE BUILT A VERY HIGH WALL, WILL IT NEED A LOT OF REINFORCEMENT SO IT DOESN’T COLLAPSE? The reinforcement is not an element of retention, a wall with lots of reinforcement if it is not sufficiently connected to the masonry may fall in its entirety. The masonry reinforcement does not provide stability itself. The reinforcement is there to provide ductility and therefore significantly reducing the risk of cracking. When assigning the reinforcement a mission to structurally support, it is imperative that the wall and support pillars are connected by anchors. WHY IS IT IMPERATIVE TO HAVE THE CE MARKING? quality assurance (of the State not the supplier). It is also the only way of checking that incorporated products in walls have the same benefits stated in calculations. There is no point calculating if there is no comparison value for gauging.